Jen & Ben Design have re-branded Krisp Landscaping to Matt Walsham Landscape Architecture, better reflecting the high calibre work they deliver to a client base that expects nothing but the best. Matt Walsham Landscape Architecture create extraordinary outdoor living spaces. They work closely with architects, and their work is a natural extension of high-end architecture. We have positioned their brand to live at this high-end design side of the market, separating them from more conventional landscaping companies. 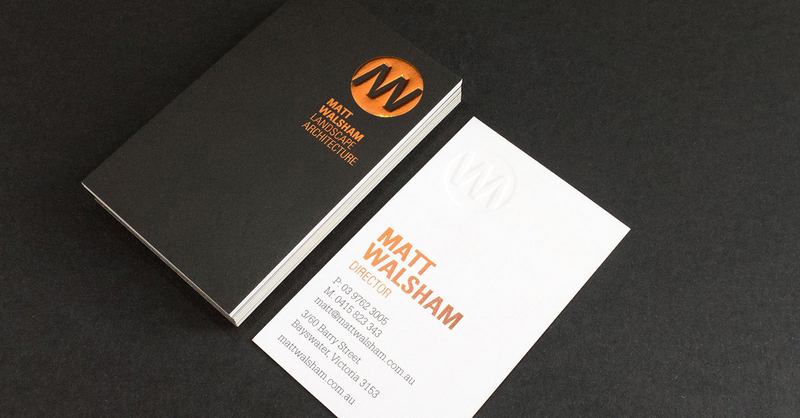 A brand strategy was developed to accurately portray the beautiful outdoor spaces that Matt Walsham is known for. Their business cards are a statement of design in themselves. The new brand elevates the business to the level it should be at, and gives them confidence to grow in a high-end market. The business cards are printed with a copper foil and emboss, on 400gsm Knightsbridge card.